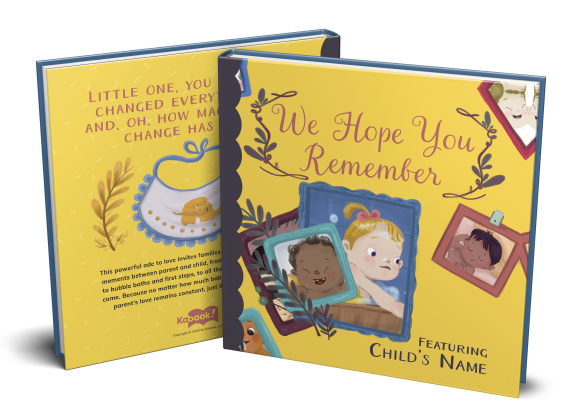 We Hope You Remember Vintage Edition | Custom Children's Book | Kabook! Get 20% off when you buy 2 or more books! Little one, you came along and changed everything. This powerful ode to love invites families to celebrate the special moments between parent and child, from hiccups and snuggles to bubble baths and first steps, and all the wondrous times yet to come. Because no matter how much babies grow and change, a parent's love remains constant, just like in the beginning. Give this story to Mom or Dad on an anniversary, Valentine’s Day, Mother’s Day, or Father’s Day. Or give to your child - at ages 3-5, or as a graduation gift, wedding gift, or pregnancy gift. Either way, Mom or Dad will need tissues. We’re not crying. You’re crying. Answer a couple questions, upload two photos, then grab a box of tissues (just in case). Enter your child's name exactly as you would like it to appear in the story. Kabook! uses sophisticated artificial intelligence and neural network processing to make your photo look like the illustration style of the book. Upload your photo and see the magic. Add one of baby's first newborn photos. Add a photo of toddler surrounded by family or holding hands & walking with parent(s). Transform Photos & Preview My Kabook! Quick tips to optimize your photo filtering results. Lower quality and dark photos can lead to distortion of facial features in the filtering process. Subject fills frame. High contrast between subject and background. Subject doesn't fill frame. Dark picture with low contrast. If a photo doesn't look like it is working, please hit the 'x' button and try another one. Like most technologies, it's really neat, but it's not perfect. ©2018 Kabook, LLC - All rights reserved. What is even better than a book under the tree at Christmas?! A mysterious letter that engages and intrigues your child -- just like our stories -- and sets up the book as coming soon. We have created a very special gift letter that you can print and package as a scroll to put under your tree or in a stocking for your child to open. Just print it, roll it up, and tie it with a bow! Each letter is designed to heighten the experience for your child and fill them with anticipation for the arrival of their new book. Also, we are offering a free digital download version of your story with your purchase that you can share with your child on Christmas day. Once you submit your order, we will email you the personalized letter as well as a free digital download. Note that a Kabook! normally takes six days to receive, but our printer gets backed up over the holidays so we can no longer guarantee that the physical copy of your book will arrive before the big day -- but trust us, your kids will enjoy this more!